Volgograd have many different bus types. 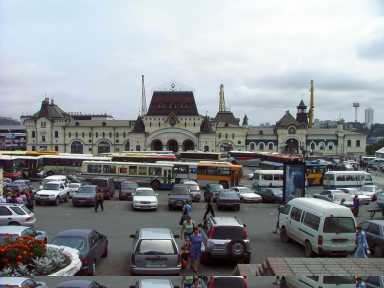 A city runs a good, frequent bus service in most of the city streets or in dissecting streets. And of course there are also the privately run, cheaper and more obliging (They will stop anywhere on request or 'at the drop of a hat') privately owned and run, (like most of Russia and Asia) Marshrutkas. Here I have a small selection of Volgograd Buses, taken quickly on the hop, no prize winning entries here. Volgograd, formerly called Tsaritsyn (1598-1925) and Stalingrad (1925-1961) is a city and the administrative center of Volgograd Oblast, Russia. It is 80 kilometres long, and situated on the west bank of the Volga River. Volgograd originated with the foundation in 1589 of the fortress of Tsaritsyn at the confluence of the Tsaritsa and Volga Rivers. The fortress, which took its name from the local name Sary Su (Yellow Water/River in the Tatar language), was established to defend the unstable southern border of Tsarist Russia and became the nucleus of a trading settlement. It was captured twice by Cossack rebels, under Stenka Razin in the rebellion of 1670 and Yemelyan Pugachev in 1774. Tsaritsyn became an important river port and commercial centre in the 19th century. The city was the scene of heavy fighting during the Russian Civil War. Bolshevik forces occupied it during 1918, but were attacked by White forces under Anton Ivanovich Denikin. During the battle for Tsaritsyn the Bolsheviks were pushed back and surrounded at first, and only the actions of Josef Dzhugashvili (nicknamed 'Stalin'), then local chairman of the military committee, saved the city for the Bolsheviks. Stalin did so by recalling Zhloba's 'Steel Division' from the Caucasus which attacked the White Forces in the rear. In honor of Stalin's efforts in defending the city, it was renamed Stalingrad (literally: "Stalin city") in 1925. The name change is typical of the way towns and cities were re-named after Bolshevik leaders and heroes during Soviet times. Under Stalin, the city became heavily industrialized and was developed as a centre of heavy industry and trans-shipment by rail and river. During World War II (Great Patriotic War), the city of Stalingrad became the center of the Battle of Stalingrad as well as the pivotal turning point in the war against Germany. The battle lasted from August 19, 1942 to February 2, 1943. In terms of loss of human life, 1.7 million to 2 million Axis and Soviet soldiers were either killed, wounded or captured, as well as over 50,000 civilians killed. The city was reduced to rubble during the fierce fighting, but reconstruction began soon after the Germans were expelled from the city. For the heroism shown during the battle, Stalingrad was awarded the title Hero City in 1945, and King George VI of the United Kingdom awarded the citizens of Stalingrad a jewelled sword in appreciation of the bravery that they had shown. A memorial complex commemorating the battle, dominated by an immense allegorical sculpture of Mother Russia, was erected on the Mamayev Kurgan, a hill that saw some of the most intense fighting during the battle. A number of cities around the world (especially ones that had suffered particularly badly during the war) established sister/friendship links (see list below). It was also the world's first 'twin city' when it formed a twinning relationship with the English city of Coventry during World War II (as both suffered heavy bombing). The Panorama museum, which is located alongside the Volga river, contains artefacts from World War II. These include a panoramic painting of the battlefield from the location of the monument "Mamayev Kurgan." Here a rifle of the famous sniper Vasily Zaytsev, who was featured in the film Enemy at the Gates, can also be found. 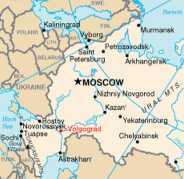 In 1961, the city's name was changed to Volgograd ("Volga City") as part of Nikita Khrushchev's programme of de-Stalinisation. This was and remains somewhat contentious, given the fame of the name Stalingrad, and there were once serious proposals to change the name back during Konstantin Chernenko's brief administration in 1985. There is still a strong degree of local support for a reversion and proposals have been made from time to time, though as yet none have been accepted by the Russian government. Modern Volgograd is still an important industrial city. Its industries include shipbuilding, oil refining, steel and aluminium production, manufacture of machinery and vehicles, and chemical production. A large hydroelectric power plant stands a short distance to the north of Volgograd. Educational institutions include Volgograd State University, Volgograd State Technical University (former Volgograd Polytechnical University), Volgograd State Medical University, Volgograd Academy of State Service, Volgograd Academy of Industry, and Volgograd State Pedagogical University. This page was retrieved and condensed from (http://en.wikipedia.org/wiki/Volgograd) see Wikipedia, the free encyclopedia, January 2008.